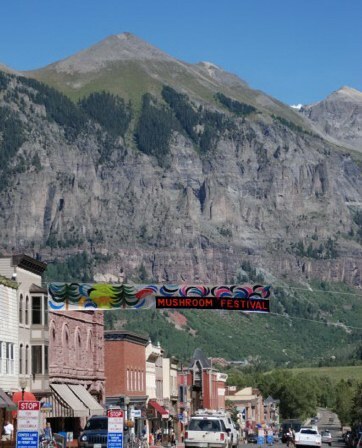 Telluride welcomes mushroomers for its Mushroom Festival. The caps of these king boletes in Colorado are nicely tanned. According to Gary Lincoff this bolete is presently best described as Boletus pinophilus , "pino-philus" meaning the pine loving bolete, rather thanBoletus edulis. 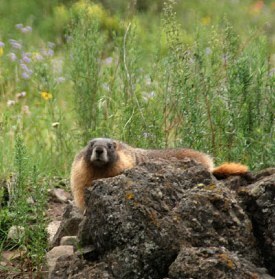 In the Pacific Northwest the king's representatives are much paler, an observation that also applies to many of the king's human subjects in the PNW. One day this Rocky Mountain bolete might end up with its own name just like the pale PNW variety. 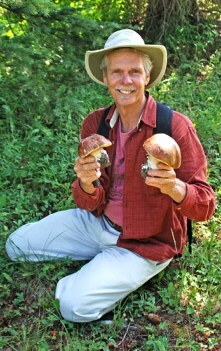 Gary Lincoff, who has been part of the mushroom festival since the beginning in 1980, is holding a king bolete. 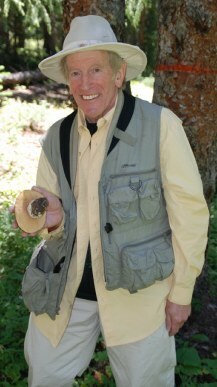 All mushroom specimen found during forays by participants are displayed in public in Telluride's Elk Park. Most specimen are identified and labeled informing about edibility, toxicity and other uses. Some might end up in the garbage can. 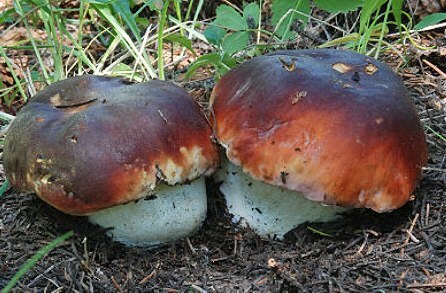 If it is a Boletus edulis or Boletus pinophilus is not so central, more important is the fact that the king is a regular at the festival. Some years are better than others! 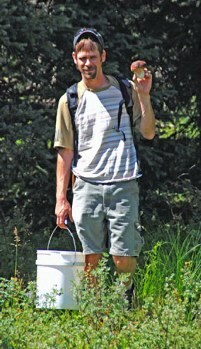 This was an afternoon of easy picking with Larry Evans in August 2010 two hours northeast of Telluride. In 2009 there were basically no boletes to be found. 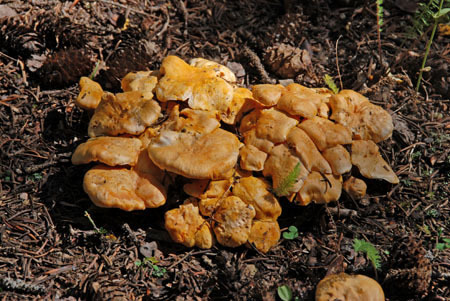 Partially that was caused by a dry August, which resulted in very few mushrooms in general. However, the next to complete lack of boletes made us speculated that the soil never warmed up enough to trigger fruiting. 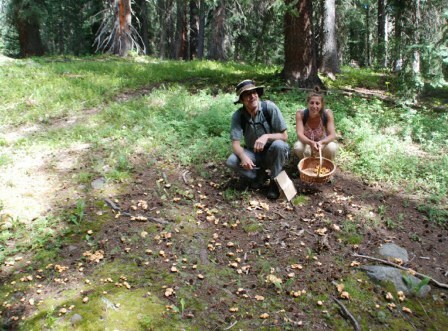 My wife Heidi and John Sir Jesse, the organizer of the festival, look in awe at the abundant congregation of chanties (Cantharellus cibarius). What was labeled as pre-festival forays for presenters turned out to be fungal heists in order to collect efficiently as many choice edibles as possible for the many delicious cooking events. 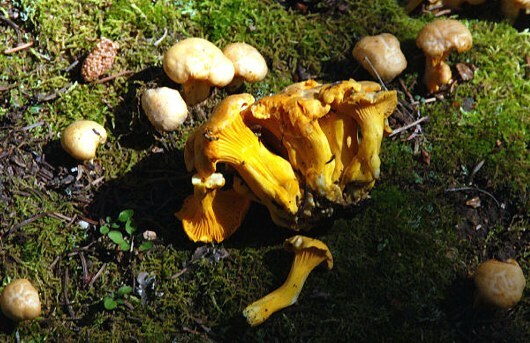 Cantharellus cibarius are not only hiding in the woods in remote secret places, they also hide under their relatively pale caps much more intensely saturated yellow ribs and stems. 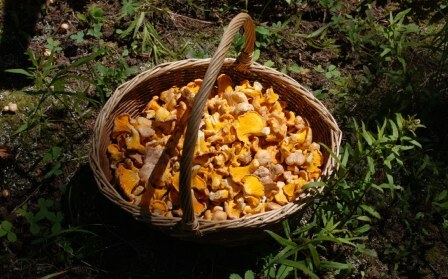 The smallish chanterelles require a quite serious "Catch per Unit Effort". The content ended up with John Sir Jesse to be fed to participants at the numerous culinary events of the mushroom festival. A nice cluster of chanties. 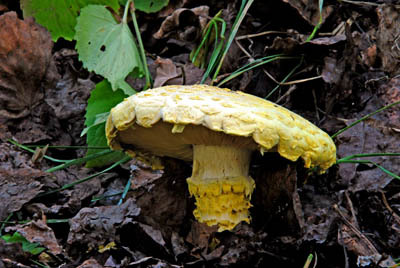 Besides all the confusion about its human inflicted identity, this scaly, yellow, medium to large mushroom is a real beauty. And it is not just a visual delight, it is also an edible. It often grows with Quaking aspen (Populus tremuloides) and other deciduous trees, where conifers are present as well. 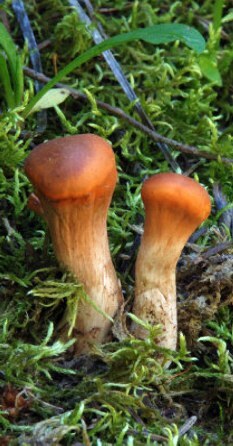 Armillaria straminea (Krombh.) P. Kumm. var. americana Mitchel & A.H. Sm, and Floccularia straminea (Krombh.) Pouzar var. americana (Mitchel & A.H. Sm.) Bon, the latter being more recent. 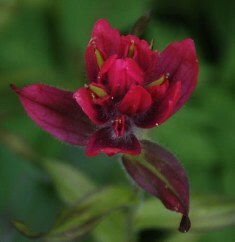 Its close European relative is named Floccularia luteovirens (Alb. ex Schw.) Pouzar. 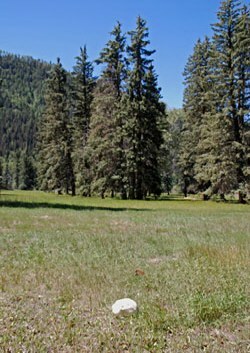 Finding this mushroom just outside of Telluride along Bear Creek trail made my day. I had not found it before in North America, but came across a very closely related mushroom in the grasslands in Tibet, where this mushroom is known as Ser sha, the "Golden Mushroom", one of Tibet's most famous mushrooms and a culinary favorite. Since many years I wanted to find giant puffballs. What a sight these mushrooms are! 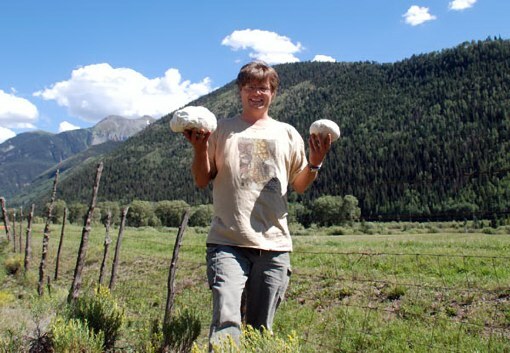 One morning during the TMF Gary Lincoff showed us a slide from a giant puffball and mentioned that they grow around Telluride. Two hours later I am driving with festival participants to a foray in the mountains. On the way out of town, I confused my passengers by slamming my brakes out of the blue. I had scanned the landscape for big white puffs and there was something like it out there! I guess I should have a sticker on the back of my car "I brake for mushrooms" and probably another one inside for new passengers. All my life I had heard stories about this mushroom. So, I was all excited when finally cooking up the puff balls. I remembered that breading thin slices was supposed to be the best recipe. When I took my first bite and paid full attention to my taste buds, I first thought my buds must be on brake. There was hardly any taste beyond the breading crust and the fungal center offered not much of a chewing experience. I was reminded of Zippy's styrofoam boots again, not that I ever fried up styrofoam, and a marshmallow would be closer in consistency. All in all when it comes to the culinary value of the giant puff ball, I am tempted to claim just as much hype as hyphae around this mushroom. However, in all fairness, it might be a typical case of having too high expectations. Maybe I get lucky someday and someone offers me an excellent giant puffball dish? This photo might generate the wrong impression that I am posing like a trophy hunter with my booty. And no, I am not showing off my old and new brain during my brain transplant surgery, I am just offering scale for these big fungi. In actuality, I am only in the picture for purely scientific reasons. 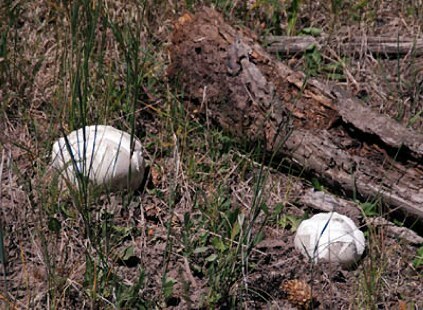 A single giant puffball can produce over a trillion spores. Some people have pointed out that eating such a sporolific fruiter is committing fungal genocide. Luckily, I don't have to eat this one again and just can enjoy it. Stranded shrimps in a Engelmann spruce (Picea engelmannii) and subalpine fir (Abies lasiocarpa) forest. These shrimps are ready to be sliced for cooking. When cooking be prepared that its fishy odor will fill your kitchen. However, the strong smell does not necessarily translate into a strong fishy taste. Note the cream-colored gills, another feature of this "shade shifter". The Shrimp Russula (Russula xerampelina) is a bit tricky to recognize, since it caps can come in many different colors, such as bright red, brownish red, maroon, deep purple, also in forms with brown caps and black centers, greenish yellow or completely honey tan, in short this mushroom is a real "shade shifter". I am showing here a common color variation. 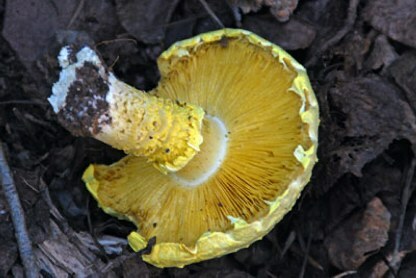 If you know how to recognize Brittle gills (Russula), luckily a genus without seriously poisonous mushrooms, you need to look for the following traits: viscid cap [when it is dry, usually some debris is glued to it], stem usually with a tinge of pink and always staining yellowish-green and then brown when handled or bruised. 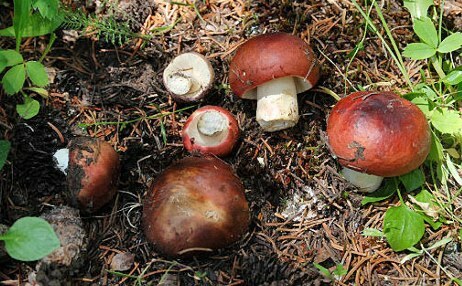 Its taste is mild, many other Russulas are peppery hot, and it has a fishy odor at maturity. But when this fishy odor gets a bit too strong in old specimen, it seems to smell of rotten fungus and is not very specific. "Shrimps" are quite common, but often one has to turn over quite a few Russula to find the Shrimps. 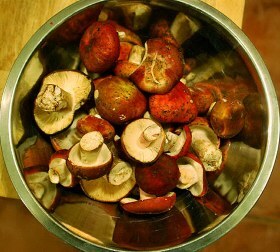 The red- tinged stem, the color change and mild taste are very hard to detect without impacting the mushroom. Sarcodon imbricatus, the Hawkwing is an abundant and ubiquitous fungus in conifer forests all over the northern hemisphere. When fruiting it puts out serious biomass. Unfortunately it is not too well reputed as an edible. 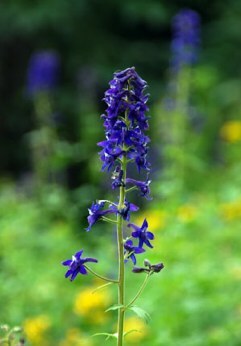 Partially it is its unique taste, partially it is supposed to cause indigestion for some. Older specimen can be too bitter to enjoy. 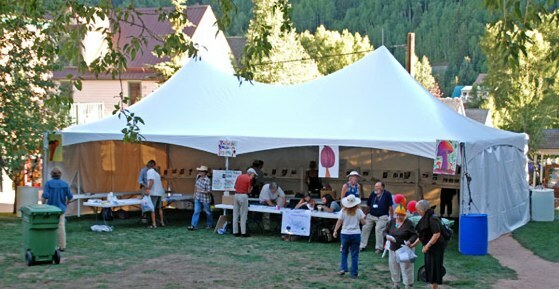 During the festival several dishes of the Hawkwing were served to participants and well received. Key to rendering this beautiful and easy to recognize fungi [cap with large dark brown scales, white to gray-brown teeth down below] is cooking it for at least 20 minutes to improve digestibility and reduce possible bitterness. Before eating the hawk wing in Telluride, the last dish of Sarcodon imbricatus I had many years ago in Tibet. There it is one of the most important economic mushrooms, but impresses by the tonnage collected and not the income generated due to low value [Sarcodon in Tibet] . Jim Gouin, bucket man and mushroom grower par excellence and Chris Hobbs, medicinal mushroom & plant expert turned out to be serious boletivores. I had to make sure I get a slice of the porcini pie. hugging a Quaking aspen (Populus tremuloides). Usually they express their fondness for each other on root level. 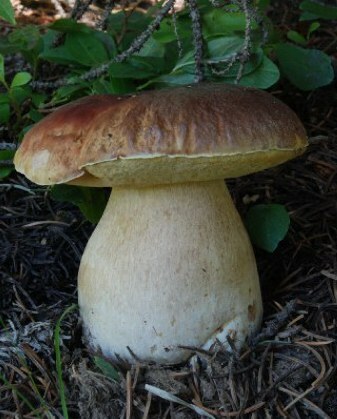 As being displayed here, "Aspen bolete" is a well placed common name. Leccinum aurantiacum is a good edible. It turns black if you don't fry it right away after slicing. 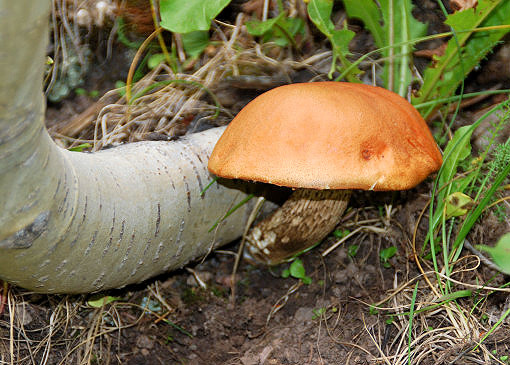 Some people react unfavorable to Leccinum, but there are more difficult members of the genus, when it comes to allergic reactions. Clavariadelphus truncatus (Quel.) Donk, the flat-topped Coral growing here in moss under conifers. This 5-15 cm (2-6 in) tall fungus is unique in having a really sweet taste. Thus, it is a choice ingredient for deserts, dishes otherwise difficult to churn out with fungal ingredients beyond candy caps. 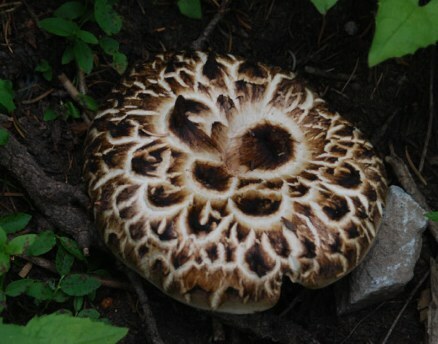 I had seen this mushroom through the years, but rather ignored it, since I was not aware of its sweet taste. 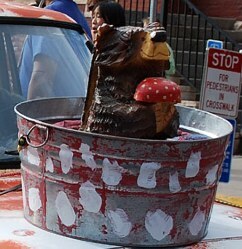 When I found it in Telluride and tasted it for the first time, I was completely surprised by its sweetness. I quickly rushed back to the spot where I had found it, looking for more of these sugar shrooms. It must have been an instant sugar high, that send me back to that spot in a state of frenzy . 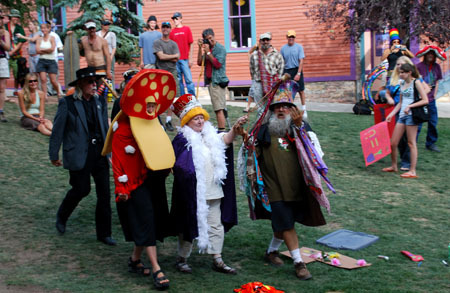 Queen Rita Amanita blesses her subjects escorted by high officials such as Art Goodtimes, one of the spirits behind the event. The mushroom parade arrived at the town park. 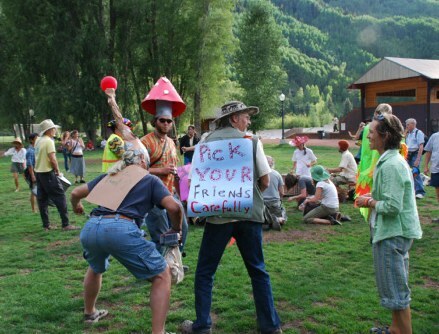 A drum circle moved Cordyceps, Amanitas and other fun guys. "Pick your friends carefully" Who is Larry Evans talking about? What an awesome sky, neither photoshopped nor fungally enhanced! 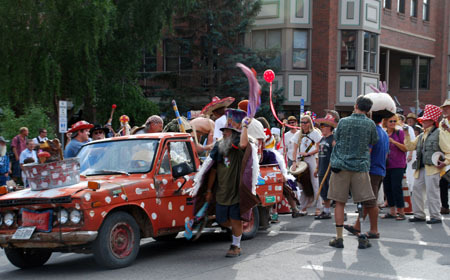 The Festival is usually from Thursday through Sunday in mid to late August. 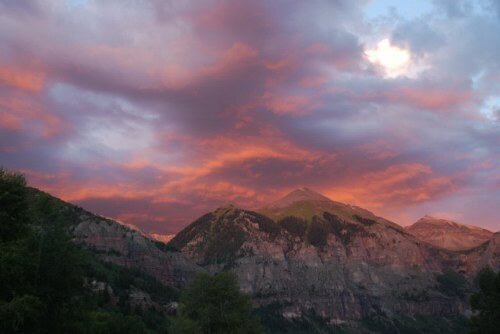 It is hosted by the Telluride Institute. 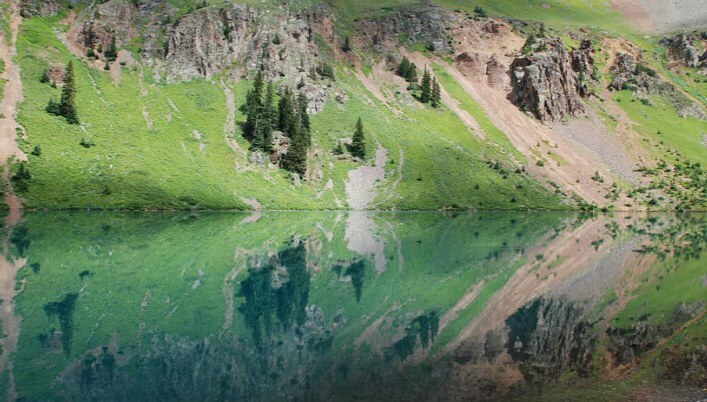 The official webpages from Telluride Institute. Gibson, Ian & Eli; Kendrick, Bryce 2008. 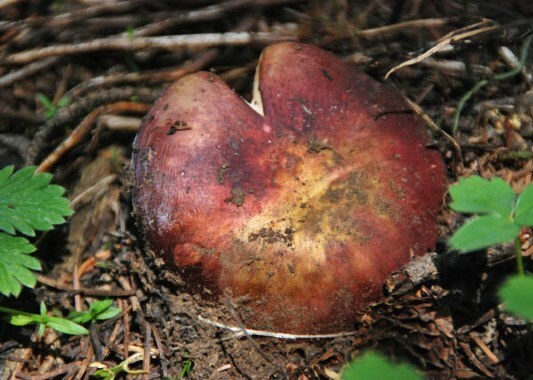 MatchMaker- Gilled Mushrooms of the Pacific Northwest 1.31 - awesome software, nearly free! Lincoff, Gary 1981. The Audubon Society Field Guide to North American Mushrooms. States, Jack 1990. 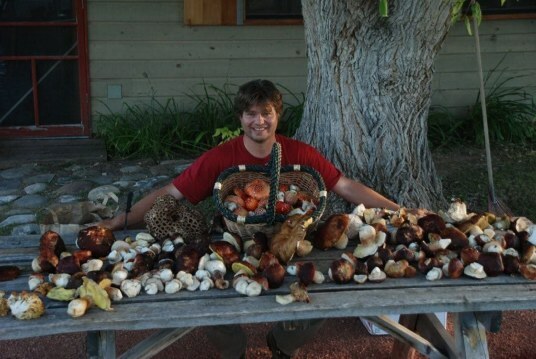 Mushrooms and Truffles of the Southwest.